On September 13 2011, Steven Woods (31) is scheduled to be executed by lethal injection by the state of Texas after being wrongfully convicted and confined 24 hours a day for the past 9 years of his life. Woods maintained his innocence since he was arrested, and he swears that he will keep doing so until he dies. – Woods was 21 at the time and had no prior arrests or warrants. – 3 months after Steven was wrongfully convicted/sentenced to death, 24 year old Marcus Rhodes took responsibility for knowingly and intentionally shooting and killing both of the murder victims, in a Denton County court. – Rhodes didn’t insinuate that Steven in any way, participated/plotted/played any role in the murders. – There is NO physical evidence or confession that ties Steven Woods to the murder scene. – No one has reported or testified to having eye-witnessed these murders. – The firearms were found under Rhodes’ bed when Police searched his parents’ home. – The weapons only had Rhodes’ fingerprints on them. – The victims’ backpacks & their belongings were found in Rhodes’ car a few days after the murders. – The only “evidence” used against Woods were friends of Marcus Rhodes who took the stand, claiming that they heard Woods brag about the murder. This is called “hearsay” & is usually inadmissible in court. – One “witness”, a habitual heroin user & friend of Rhodes’ was paid 1000 dollars for his testimony. -Another “witness” signed a sworn affidavit stating that her testimony was coerced with threats. -The state tried to use DNA found on a latex glove to convict Woods. The jury was told that the DNA on the glove was Woods’, but later in the trial Steven demanded that the glove be tested. The DNA did NOT match Woods’. The glove was stricken from the protocol by Denton County Judge, Lee Gabriels – so that Woods could not use it to prove his innocence in his appeals process. – The prosecution accused Woods of numerous erroneous claims to which they had no basis. Example: The prosecution lied to the jury claiming that Woods (who they did not know was of Armenian heritage), was a “white supremacist”. -The man who confessed to killing the couple, also confessed to carrying out an additional murder in CA that occurred 2 months prior to the Denton murders. Steven did not participate in that murder, nor did he witness it or get indicted in association with it. -The actual murderer, Rhodes got a punishment of life in prison with parole. 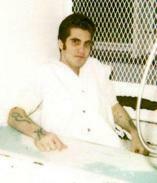 -Steven Woods got sentenced to death and will be executed on Sept. 13 2011.